Rob Arcand: "Stack Music: Spotify and the Platformization of the Digital Music Commodity"
Nina Feng: "Contemporary Japanese Art Auction Market 2008-2017"
Angelina Liu: "The Alife Bestiary: An AR Object Recognition Project on the Archivolt of Alife"
Kira Xie: "Reimagining Model Minority: An Inquiry into the Post-1965 Chinese Immigration in the United States"
Room A266 (The Collision Space) in Bay 10 on the second floor of Smith Warehouse. 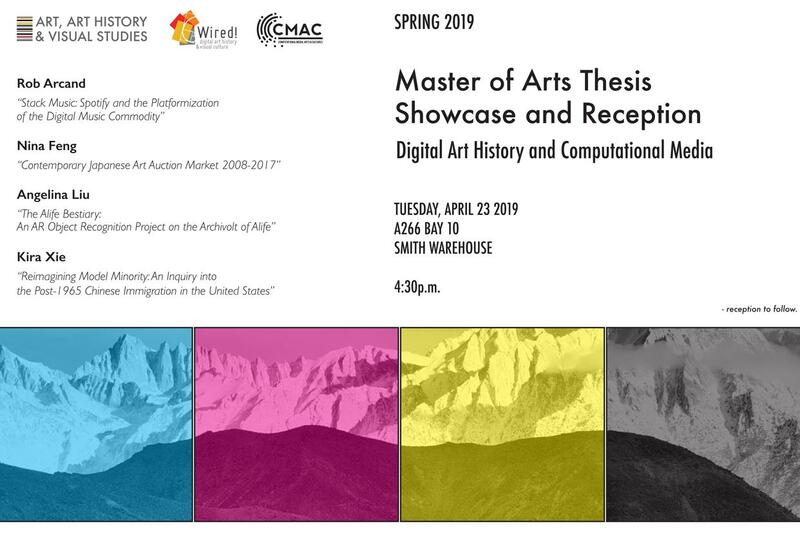 Students will give brief project presentations followed by a Q&A and then a reception to celebrate. Everyone is invited to attend.